Sonsari is an erect annual herb 20-25 cm tall. Stem is covered with velvety hairs. The upper part of the plant has many slender branches in corymbs. Alternately arranged elliptic, lancelike leaves are 5-8 cm long. The leaves have serrated margins, and the are covered with hairs on both sides. While the lower leaves have stalk, the upper ones are stalkless and stem-clasping, with heart-shaped base. 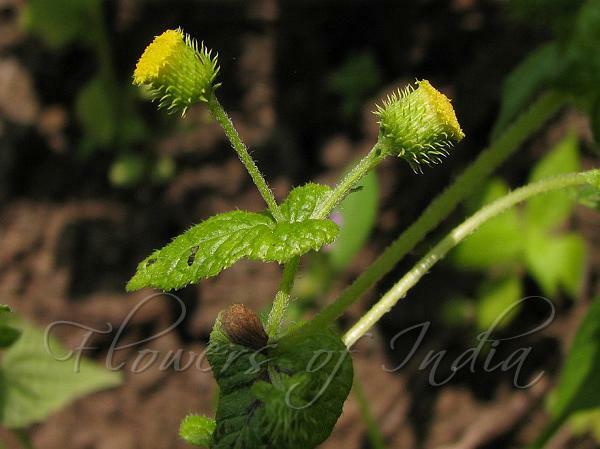 Yellow flower-heads, 2 cm across, occur in corymbs, on verly slender, hairy, branched stalks. 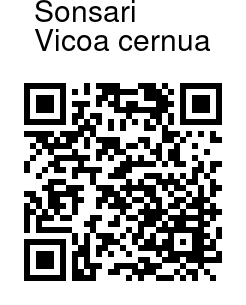 The species name cernuum means nodding, referring to the flowers on the slender, bending stalks. Leaf-like bracts are present in the middle of the flower-stalks. Ray flowers are 20-40 in number, linear and 3-notched at the tip. Sonsari is occasionally seen in forest clearings at high elevations in the Western Ghats. Flowering: November-February. Photographed at Vasota fort, Maharashtra.